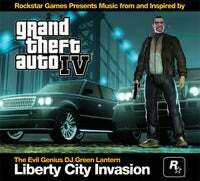 Rockstar Games and Future Green Entertainment announced a new album from The Evil Genius DJ Green Lantern, titled "Liberty City Invasion: Music from and Inspired by Grand Theft Auto IV". The eight GTA-exclusive tracks DJ Green Lantern wrote for Liberty City's "The Beat" radio show, which he hosts, will be on the album, along with eight new songs inspired by the game. He's joined by some major hip-hop, reggae and R&B artists, including Busta Rhymes, Wyclef, Fat Joe, Styles P and Fabolous, and several other new artists and talent from DJ Green Lantern's label will feature on the album as well. The Rockstar team has somewhat of a reputation for its particularity when it comes to musical selections for the game, and executive producer Sam Houser said he's excited about this album and its "true New York flavor." "Liberty City Invasion: Music from and Inspired by Grand Theft Auto IV" will be available digitally on May 20th, to be followed by a physical disc launch at an unspecified date. Today, Rockstar Games and Future Green Entertainment are proud to announce the release of an original production album from The Evil Genius DJ Green Lantern featuring music from and inspired by Grand Theft Auto IV. Containing eight brand new tracks crafted exclusively for DJ Green Lantern's "Liberty City Invasion" radio show on the in-game radio station "The Beat," as well as eight new songs directly inspired by Grand Theft Auto IV, The Evil Genius DJ Green Lantern has created an epic urban soundtrack. This special album release features an incredible lineup of hip-hop, reggae and R&B superstars including heavyweights Busta Rhymes, Wyclef, Fat Joe, Styles P and Fabolous as well as up-and-coming artists Mavado, Uncle Murder and Future Green Entertainment's own Johnny Polygon, Qadir and more. Singles include "Where's My Money" from Busta Rhymes and "Nickname" from the brand new artist Qadir. The perfect summer anthem "I'm So Fly," featuring Fat Joe and Fabolous is inspired by Grand Theft Auto IV and while included on the album is not in the game. "The Grand Theft Auto games have always featured stunning soundtracks and the amount of eclectic music in Grand Theft Auto IV goes above and beyond anything we have been able to do before" said Sam Houser, Founder and Executive Producer of Rockstar Games, "DJ Green Lantern's contributions give the soundtrack a true New York flavor and we're excited to be releasing his full album to fans." "From making mixtapes, to being on the radio, to touring with the biggest artists on the planet, and then for the biggest video game title to solicit me to create exclusive music is something most people could only dream about, it's like a graduation," said Green. "Rockstar Games understood what I bring to the table as far as not just presenting music, but creating music." Green Lantern originally came to prominence in the mixtape scene by consistently featuring exclusive self-produced music with hip-hop superstars like Eminem, Jay-Z, The Beastie Boys, Mike Shinoda's Fort Minor, D-Block, Busta Rhymes, Mobb Deep and many more. This led to an acclaimed career as a proper music producer in his own right which has yielded such Billboard hits as "Number One Spot" by Ludacris and "In The Ghetto" by Busta Rhymes featuring Rick James as well as the street hits Akon "Ghetto" feat. Notorious B.I.G. and 2Pac, Uncle Murda's "Bullet, Bullet," and many more. Green Lantern can be heard every week nationally on his Sirius Satellite Radio show. The Evil Genius Green Lantern makes his official production album debut with the release of Liberty City Invasion: Music from and Inspired by Grand Theft Auto IV. It will be available at all major digital retailers on May 20th with a physical release coming soon. Grand Theft Auto IV is currently available for the Xbox 360® video game and entertainment system and the PLAYSTATION® 3 computer entertainment system.